Enjoy the Galápagos Islands with their astonishing natural beauty, the legends of Peru’s Sacred Valley and the passion of Brazil, Argentina and Patagonia. Embark upon the adventure of a lifetime. 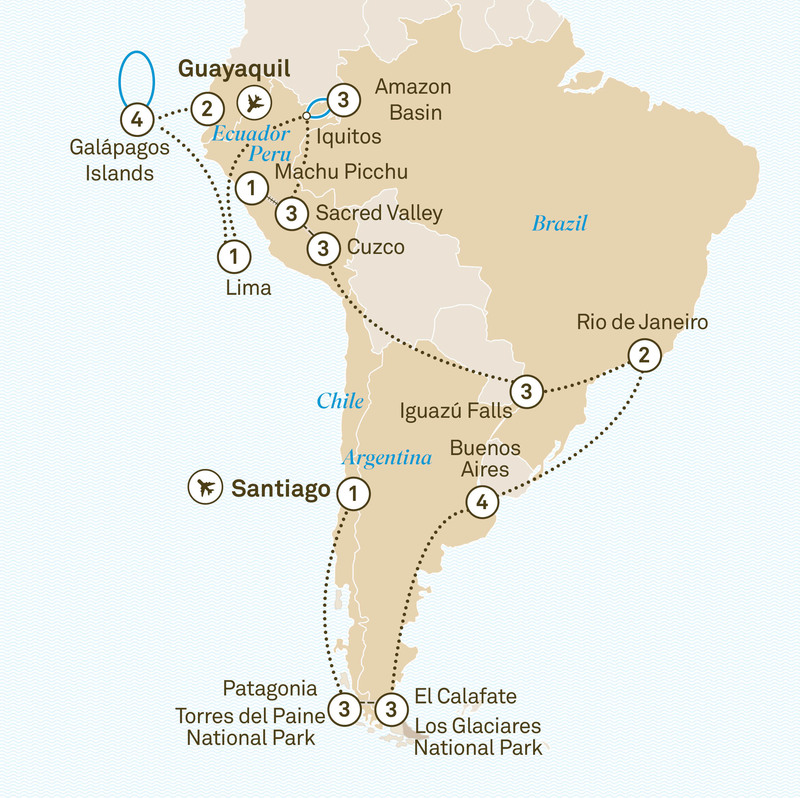 From the Galápagos Islands with their astonishing natural diversity, to the legends of Peru’s Sacred Valley and the passion of Brazil, Argentina and Patagonia. Fly to the mighty Galápagos Islands where you’ll relish the chance to observe unique wildlife in their natural habitat. Cruise the Amazon in luxury, then discover the grandeur of the ancient Incan site of Machu Picchu before seeking out the wonders of Cuzco. Buenos Aires will introduce you to the Tango, and Iguazú Falls will quite simply take your breath away. You’ll finish in spectacular Patagonia. Welcome to Ecuador. A world of wonder awaits as you start your journey with a two night stay in Guayaquil. Take a tour to discover the city’s secrets before an afternoon at leisure. Join your Tour Director for a delicious welcome dinner this evening. Fly to the Galápagos Islands. Settle into your airconditioned stateroom with large picture windows on board the stylish Santa Cruz II, your home for the next four nights. Over the coming days on a range of shore excursions you will see a rich variety of landscapes, fearless marine and land animals, and colourful birdlife, all still relatively untouched by man. Cruise the Galápagos Islands and enjoy a range of shore excursions. Farewell the crew and take away memories of an amazing experience as you disembark and fly to Lima for an overnight stay. Fly to Iquitos and settle into your over-sized suite on board Delfin III, your luxurious floating Special Stay for the next three nights. Each day there will be a range of small group excursions to discover the diversity of this region. You will explore remote Amazon River tributaries, spot monkeys and birds whilst walking along a jungle trail, visit local villages and schools and meet with native Amazonians. Board the skiffs and cruise along the waterways, or go onshore for excursions through the jungle led by knowledgeable naturalist guides. Board the skiffs and cruise along the waterways, or go onshore for excursions through the jungle led by knowledgeable naturalist guides. This morning fly to Cuzco and then travel to the Sacred Valley of the Incas. Your three night stay allows you to experience the history, unique lifestyle, culture and majestic scenery of this heartland of the former Inca Empire. Enjoy a walking tour through the charming village of Urubamba. Learn how to make two of the country’s signature offerings, ceviche and pisco sours, during a cooking monstration. Then, marvel at the pectacular views from the glass dome carriages on your rail journey through the incredible Andes. Continue to the charming city of Cuzco and your luxurious hotel, in the heart of the historic centre. Your three night Special Stay is sure to be a highlight. Tonight sample elegant à la carte dining at the Inti Raymi restaurant or dine on a menu showcasing delicious fusion cuisine in the Cicciolina restaurant. Fly to the magnificent natural wonder of Iguazú Falls for your three night Special Stay at the elegant Belmond das Cataratas Hotel, set inside the park gates. As a guest of the hotel you will be able to experience the sun setting over the top of the falls without the general public. At Sugarloaf Mountain, take the cable car to the top of the peak, where you will enjoy Scenic Sundowner drinks while taking in the spectacular views of Rio and the surrounding landscape at sunset. of this famed ‘Paris of the Americas’ with your local guide, including Casa Rosada. Visit soulful San Telmo and La Boca’s colourful Caminito. This evening enjoy dinner at the Gala Tango show. Take a tour with a local artist to uncover the vibrant urban art scene. Alternatively, discover the city’s green side on a bike tour of the city’s parks and plazas, or take an architecture walking tour. Join your Tour Director and fellow travellers for a farewell dinner and indulge your senses in one of Buenos Aires’ coveted closed-door restaurants, and enjoy a modern Argentine meal with wine pairing – complete with an empanada making class. Fly to El Calafate, the gateway to Los Glaciares National Park in Argentine Patagonia and enjoy a relaxing three night stay. Discover the traditional way of life on an estancia (ranch) in the Argentine countryside, surrounded by glaciers, snow peaks and lakes of great natural beauty. This evening is at leisure to experience one of the many quaint restaurants and cafés. Drive to Patagonia and your luxurious retreat, set in the heart of the park on the shores of Lake Pehoe, the perfect base for a three night Special Stay. Settle into your tastefully appointed room, with sweeping views across the lake to the Paine Massif and enjoy a range of daily excursions, complimentary beverages and delicious meals featuring Patagonian specialities. Your exciting adventure into one of the most spectacular national parks in the world begins. Boasting glaciers, waterways, the peaks of the Paine Massif and a range of wildlife including the elusive puma, your days exploring will be a memory to treasure. Each day there are several small group activities for you to choose from and enjoy at your own pace, all escorted by expert expedition guides. Continue to explore Torres del Paine National Park, there are several small group activities for you to choose from and enjoy at your own pace, all escorted by expert expedition guides. Join your Tour Director on your final evening for a farewell dinner.